I know, it’s been a while since I’ve been around here. In fact, it’s been a while since I’ve been able to spend any time making things at home. I have been busy with work, and that has prevented me from spending any time on the hobbies I love. The biggest problem over the last six months has been my commute. Traveling an hour each way to work is bad enough. But it has also thrown off my sleeping schedule, so I feel tired when I actually find some free time. And if I’m tired, then I’m not motivated to do much. Fortunately, that will change in the very near future. Within the next month, I plan on switching to a 100% remote work situation. The hours I’ll gain back each week will be great, plus I’ll actually be well-rested and motivated to start some new personal projects. 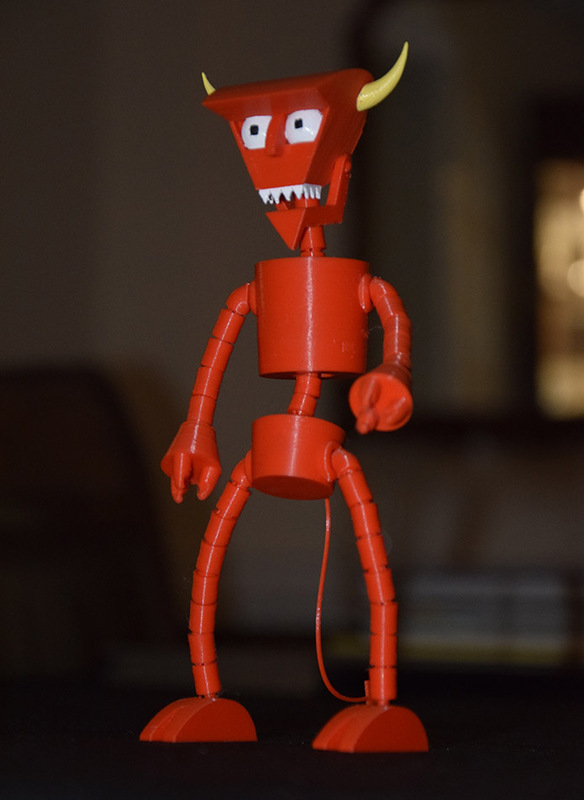 This poseable model of the Robot Devil from Futurama was a lot of fun to print. And to make painting the eyes easier, I printed out this improvement from another Thingiverse member. I look forward to having more time to make things on my own again. Although I enjoyed printing and putting together a pre-built model, I miss designing and building things from scratch. Previous post: ← Make a Dice Tray For Under $10!